Foundation broodmares have a reverent mystique. The most acclaimed have founded families of champions and top sires and dams for many breeders fortunate enough to acquire members of these elite Thoroughbred families. These families have had considerable influence on Thoroughbred breeding, producing top class stakes winners regularly from generation to generation. In the case of the great broodmare Feola, the Royal Studs of her majesty Queen Elizabeth II, Claiborne Farm in Kentucky and various other top level breeders have been rewarded with the offspring descending from Feola. The list of world class colts and fillies in tail female line from this one remarkable mare is simply staggering. Feola was bred in England in 1933 by Lord St. Davids. She was sold as a yearling the following year to Brigadier General “Mouse” Davis acting on behalf of King George V. Feola was by the Royal Studs own stallion Friar Marcus, winner of the Rous Memorial Stakes and the Middle Park Plate. Friar Marcus was considered as a great miler and a very reliable source for speed. He was consistently in the top ranks of sire lists during his career and earned a broodmare sire championship. The dam of Feola was Aloe, a great broodmare in her own right. Aloe has several branches from which world class stakes winners descend from, apart from the Feola branch. Aloe’s daughters Sweet Aloe, Aroma and Malo have many stakes winning tail female descendants stemming from their own lines. Descending from Aroma alone are such names as Persian Maid, Obeah, Dance Spell, Discorama, Go For Wand, Atan (sire of Sharpen Up), Fappiano, Known Fact, Tentam and Gone West. From Sweet Aloe there are the descendants Salsabil, Alcide, Parthia and Flame Of Tara. However, we will look at Feola and the legacy of her family, an incredible family of champions around the world. Feola raced under the colours of Lord Derby, who leased the filly from royal patronage in 1936 as a three year old. The King had passed away in January and the entire racing stock was leased until a resolution could be made pertaining to the King’s thoroughbred holdings. The subsequent abdication from the throne by his son Edward VIII in December of 1936 would then see the Thoroughbred program go to the second eldest son of King George V, Prince Albert. Albert would assume the regnal name of George VI, his full name was Albert Frederick Arthur George, and would enthusiastically embrace racing during his reign as monarch. Furthermore, he was to be instrumental in encouraging his daughter Elizabeth’s love for horses and racing. Feola was considered as one of the top fillies of her generation during her three year old campaign. She came second in the 1000 Guineas to Lord Derby’s great filly Tide-way and third in the Epsom Oaks to Lovely Rosa. She was retired due to injury. Feola went on to produce ten foals, eight of which were fillies, with three of her daughters and one son becoming stakes winners. However, due to King George VI and then his daughter Queen Elizabeth II operating the Royal Stud on their own personal family wealth and not with public or government money, there would have to be culling of breeding stock in order to maintain the program financially. Hard choices were needed to ensure that the operation ran within budget. Subsequently many of the better broodmares from families such as Feola’s were sold in order to keep the Thoroughbred program in the black. Savvy breeders from around the world benefited from such sales. The first foal produced by Feola was a filly named Foretaste. She was a bay sired by the Aga Khan III’s good stakes winner Umidwar. Foretaste won one race as a three year old and later produced daughters Windy Cliff, Good Vintage, Forest Hills and Fontarabie. Windy Cliff is the dam of Ascot Gold Cup and Prix du Cadran winner Lassalle, as well as stakes placed Serjanie. Serjanie in turn is the dam of graded stakes winner Sir Brink. Forest Hills was exported to the U.S. and would produce multi stakes winner Satan’s Hills, while Good Vintage became a stakes producer in Australia. Fontarabie is the dam of stakes winners Fontarabal, Fontabal and Sonbie, the latter of which is the dam of multi stakes winner Prepaid. Second foal from Feola was an unraced daughter of Noble Star named Starling. This daughter of Feola went to Argentina and is responsible for multi classic winner Sideral, who went on to become one the more important sires in South America during the 1950’s and 60’s. His full sister Siderea was the champion three year old filly in Argentina in 1953 and has also made her presence felt in South American breeding through her daughters Star Of India, Starlight and Stella. Two more full sisters to Sideral, unraced Pleyades and stakes winner Sagitaria also became producers of noteworthy stakes winning offspring. The family of Feola in South America has been a very productive family. Feola was barren for the next breeding season, but in 1941 she produced her third successive daughter. Bred by King George VI, Knight’s Daughter was by July Cup winner Sir Cosmo. Knight’s Daughter won three of her four starts during the limited war time racing schedule she was to take part in, and was retired due to injury. She produced four foals for the King, the first three amounting to nothing significant on the track, but the fourth was Love Game, sired by the King’s 2000 Guineas winner Big Game. Love Game won the Kingsclere Stakes as a two year old during her only racing year. She was sold as a potential broodmare, as the King’s breeding advisers were trying to keep the breeding population to a workable level. Love Game would produce the excellent broodmare Nas-Mahal by Nasrullah after she was relocated to the U.S. Nas-Mahal produced seven stakes winners including champion three year old filly Turkish Trousers and Hollywood Derby winner Tell. Also within this side of the Feola family are grade/group one winners Balzac, Craelius and Snap Apple, as well as multi stakes winners Epidaurus, Celine, Petalia and Good Economics. King George VI sold Knight’s Daughter in foal to Watling Street at the Newmarket December sales to one A.B. “Bull” Hancock. The price was two thousand and five-hundred guineas. The foal she was carrying was a filly named Yarmouth, a minor winner of only one race from sixteen starts. Yarmouth died young, but did produce a stakes winning filly named Salt Lake, who in turn is the grand dam of stakes winners Slip Screen and Tuscarora. Knight’s Daughter however will always be revered for her contributions to Thoroughbred history for the two full siblings she produced by Princequillo, the colt Round Table and the filly Monarchy. Round Table is one of the greatest Thoroughbreds of the twentieth century. He was from the legendary foal crop of 1954 which included Bold Ruler, Iron Liege, Gallant Man, Nearctic, Barbizon and King Hairan. In fact he was born within hours of Bold Ruler at Claiborne Farm and would return to stand stud beside his rival there. Round Table was a slightly smaller than average horse in size, but was larger than most in courage and determination. He made sixty-six starts lifetime, winning forty-three races, placed second eight times and third five times. He was a three time grass horse champion, two time handicap champion, the 1958 horse of the year and the 1972 champion sire in North America. His legend is unquestioned as to his racing and breeding careers. Full sister Monarchy, while not a great racer like her brother, is still a highly revered contributor to Thoroughbred breeding. As a granddaughter to Feola, Monarchy has in essence produced a legacy that could nominate her as a foundation mare in her own right. Monarchy produced only two stakes winners, Title and Fabled Monarch, and stakes placed Blade by Bold Ruler, who became a sire of fifty stakes winners. However through her daughters, namely State and Isobella, she has set forth a wonderful line of sire producing broodmares. State by Nijinsky, was no world beater on the track. She won three of thirty-four races, with no black type. She is the dam of multi stakes winners Announce by Forty Niner, Double Feint by Spectacular Bid, Narrate by Honest Pleasure and the gelding Region by Devil’s Bag. Narrate however is the dam of Frizette Stakes winner Preach by Mr. Prospector, who in turn is the dam of the very important sire Pulpit by A.P. Indy. Pulpit is the sire of Leading North American sire Tapit. Pulpit shows two crosses of Knight’s Daughter (6×5) in his pedigree. Preach has a full sister named Yarn, who has produced grade one winner Minardi by Boundary and grade two winner Tale Of The Cat by Storm Cat. Both sons are highly regarded sires. Yarn’s daughter Myth by Ogygian is the dam of Breeder’s Cup Juvenile winner Johannesburg, an additional well regarded sire within the family. Another of Monarchy’s daughters Cherry Valley is the grand dam of champion two year old filly Tessla. Isobella by Bold Ruler is the dam of Isobelline by Pronto, who in turn is the dam of multi stakes winner Robellino by Roberto. Robellino began his stud career at Windfields Farm in Maryland and then was subsequently relocated to England to complete a successful stud career, after Windfields closed the doors to their Maryland operation. So far in this recount of the legacy of Feola one will notice that her owner King George VI or his heir has not reaped much reward from her gifts. The next foal after Knight’s Daughter would be Yorkshire Cup winner Kingstone, a son of King Salmon who was a direct tail male grandson of The Tetrarch. Kingstone was not be very successful as a sire however. The next filly foaled by Feola would however become a great success for not only the King, but also for his daughter Elizabeth after she became the ruling monarch of the British Commonwealth. Hypericum was sired by the pre-eminent Hyperion and carried the Royal silks to victory in the Dewhurst stakes as a two year old and then the classic 1000 Guineas the following season. Hypericum was retained by the Royal bloodstock advisers and left a lasting effect on the Royal Stud. Her daughter Highlight by Borealis was stakes placed, but in 1971 produced one of the finest fillies to ever race for a ruling monarch. Highclere was named after the grand castle of Lord Carnavon, the racing manager of Queen Elizabeth II. This is the same castle used in the highly popular TV program Downton Abbey. Highclere was sired by Queen’s Hussar, the sire of the great Brigadier Gerard. Queen’s Hussar was a top class miler in his racing days but an average stallion, with the exception of his two previously mentioned champions. Highclere captured two classics for the Queen, the 1000 Guineas and the Prix de Diane (French Oaks) in 1974. She would face many of the top fillies and mares during her racing career, such as Dahlia, Comtesse de Loir and Allez France. Highclere finished a bang up second to Dahlia in the King George VI and Queen Elizabeth Stakes. 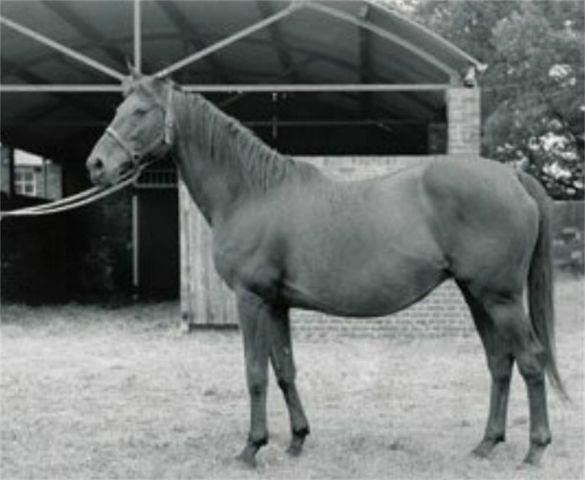 As a broodmare, Highclere had great success with her multi stakes winning son Milford by Mill Reef, and her excellent champion two year old daughter Height Of Fashion by Bustino. However, as with other members of the Feola clan, the Queen did not benefit a great deal from any breeding success from daughters of Highclere. Height Of Fashion followed up on her two year old championship season with a solid campaign as a three year old. She took the Lupe Stakes at Goodwood in early May and was considered as a prime candidate for the upcoming Epsom Oaks. She did not start again however, due to a slight injury, until July in the Princess of Wales Stakes against older boys and girls. She won the race by two lengths making all the running in the twelve furlong event, defeating the very good double Ascot Gold Cup winner Ardross in the process. Shiekh Hamdan Al Maktoum then purchased Height Of Fashion from Queen Elizabeth II for a reported 1.5 million pounds. Shiekh Hamdan entered her in the King George VI and Queen Elizabeth Stakes but the filly would have a difficult day. When the stalls opened, Height Of Fashion banged her head severely and never became a factor in the race. Following a last place finish to the very good Awaasif in the Yorkshire Oaks, Height Of Fashion was retired to broodmare duty, and what a broodmare she became! Among her foals are Unfuwain and Alwasmi, both sired by Northern Dancer. Unfuwain emulated his mom by winning the Princess of Wales Stakes. He also took the Jockey Club Stakes, the Chester Vase, John Porter Stakes and was second to Mtoto in The King George VI and Queen Elizabeth Stakes. Unfuwain became a good source of stamina in modern pedigrees, getting the likes of Petrushka (Irish Oaks, Yorkshire Oaks, Prix de l’Opera), Lahan (1000 Guineas), Lailani (Irish Oaks, Flower Bowl Handicap), Alhaath (Dewhurst Stakes), Eswarah (Epsom Oaks) and Bolas (Irish Oaks). Full brother Alwasmi won the John Porter Stakes and nomadic stud career saw him stand stud in Canada, Germany and Italy. Height Of Fashion produced Fred Archer Stakes winner Mukddaam by Northern Dancer’s great sire son Danzig in 1987 and Nayef by Gulch in 1998. Nayef was a top class runner winning group one races such as the Dubai Sheema Classic, Champion Stakes, Prince of Wales Stakes and the Juddmonte International Stakes at York among his nine stakes wins in his racing career. He is currently standing stud at Shadwell Stud in Norfolk, England. The most decorated of Height Of Fashion’s children however was her colt foal of 1986 by Blushing Groom. Nashwan became one of the best race horses seen within the past thirty years. Nashwan won both his starts as a two year old taking a maiden Stakes at Newbury and the Autumn Stakes at Ascot. His three year old campaign would be one for the ages. Nashwan won the 2000 Guineas, Epsom Derby, King George VI and Queen Elizabeth Stakes and the Eclipse Stakes, all group one events. His subsequent third in the grade two Prix Niel was not only was his first loss, but also his last race. Nashwan would have an up and down career at stud before he died from the complications of an operation to a leg injury. He did sire the two time champion older horse in Europe in the great Swain. Another daughter of Highclere to have an impact in world breeding was Burghclere. Burghclere was sired by the very good stayer Busted, sire of Bustino. Burghclere on the track was only stakes placed but did produce two Pretty Polly Stakes winners in Capo Di Monte and Wind In Her Hair. The latter was then imported to Japan and bred to Sunday Silence, where she became the dam of the great two time champion Deep Impact. Deep Impact has been sensational at stud, and is one of the top five sires currently plying their trade in the world today. Returning to our heroine Feola, we shall now look at another of her outstanding daughters. Above Board was by the 1943 Epsom Derby winner Straight Deal. Above Board was a very good stayer winning the Yorkshire Oaks and beating the boys in the two and one-quarter mile Cesarewich Handicap. In the role of broodmare for Queen Elizabeth II’s breeding program, Above Board would produce St. James Palace Stakes winner Above Suspicion by Court Martial as well as multi stakes winner Doutelle by Prince Chevalier. Above Board is also the dam of Arbitrate by Ascot Gold Cup winner Arbar, a son of Djebel. Arbitrate produced the unplaced filly Guiding Light who in turn is the dam of La Dolce. The latter was bred to Sharpen Up, a son of Atan who was a direct descendant of Aloe. The resulting foal from the Sharpen Up – La Dolce mating was a chestnut filly of 1981 named Pebbles. Pebbles has been one of the truly great race mares of the past thirty years. Her dominating performance in the 1985 Breeder’s Cup Turf at Aqueduct was the crowning achievement of a stellar career which also included wins in the 1000 Guineas, Eclipse Stakes, Champion Stakes, and Trusthouse Forte Mile. Pebbles was a very memorable filly. One more filly foal of Feola has to be mentioned here, and this one was very good to the Royal Stud. Angelola was by the excellent sire Donatello, a son of Blenheim. Angelola was no great concern on the track but when she was bred to the epoch stallion Hyperion, she produced in 1950 Aureole. Bred By King George VI, Aureole would race in the colours of Queen Elizabeth II after her father passed away and she ascended the throne. Aureole was a nervous, somewhat volatile colt with a fiery red coat matching his personality. For the Queen, he would win the King George VI and Queen Elizabeth Stakes, the race named in honour of her parents, during her coronation year. The win was one of the most popular victories by any Thoroughbred in modern history. Aureole also won the Coronation Cup, Lingfield Derby Trial, Hardwick Stakes, Cumberland Lodge Stakes, and was second to Pinza in the Epsom Derby for the then young monarch. This is the closest the Queen has ever come to winning the one major race which has eluded her. At stud Aureole became a two time leading sire in England standing his career at the Royal Stud at Sandringham. Among his get are Epsom Derby winner St. Paddy, St. Leger Stakes winners Aurelius and Provoke, Prix de l’Arc de Triomphe winner Saint Crespin and multi stakes winner and top sire Vienna, who in turn sired Arc winner and top sire Vaguely Noble. This is quite a long list of influential sires and broodmares that are direct descendants of Feola. When we look at the pedigree of Feola we see some clever and thoughtful inbreeding. She is line bred to the very good sire Hampton (5x5x5), to the great Isonomy (5×4) and to St. Simon’s sire Galopin (5×5) with one of the crosses coming through St. Simon. Her sire Friar Marcus was a top notch miler while her dam sire Son-In-Law was one of the great stayers in history. Thus the perfect blend of speed and stamina was passed on from Feola, with the help of well bred and correct conformation sires. The remarkable fertility to transmit such attributes from generation to generation some six or seven removes from Feola is testament to the excellence of the family, with such greats as Round Table, Aureole, Highclere, Pebbles, Nashwan, and Sideral to recap just a few. The legacy of the Feola family is still reverent today. Don’t believe me? Just look at the accomplishments of the very good recent sires Johannesburg and Tale Of The Cat, as well Deep Impact and Tapit, two of the top five sires in the world today. This Queen of the Turf was key to establishing the Queen of the Commonwealth’s racing stable and establish a regal bloodline for future Thoroughbred Kings and Queens. I didn’t know about Feola but have heard about lots of her descendants. I read about La Trioenne all the time but this one has just as many great horses under her. Thanks for the article Colin and teaching me about a great mare I had never heard of. I very much enjoy your stories you write about the great mares in history. I always hearcaboutvthe stallions and top colts but not so much aboutvthe girl horses. I have never herd of Feola before i read this. What a great mare she was and a great family she has. Very interested in learning more so i look forward to reading what you write when you write about the girl horses. I so enjoyed reading this story of Feola. And if I ever have an audience with the Queen we will have plenty to talk about. Love all you articles. And Feola will forever have a place in thoroughbred history. Thank you. Best equestrian history post ever. Thank you so much!